Hearts claimed the victory they needed in the final Edinburgh derby of the season after an afternoon to forget for city rivals Hibs. Michal Pospisil set the tone when he grabbed the opener after just 30 seconds, before Andrew Driver took advantage of a blunder from goalkeeper Andrew McNeil to seal the 2-0 win. However, the JT’s were left to face an anxious wait to see if their fight for a UEFA Cup spot would go to the last day of the season, with European rivals Aberdeen in action at Celtic Park later in the day. There may have been sunshine on Leith just a couple of months ago when Hibs stormed to victory in the CIS Insurance Cup final but storm clouds have been gathering over Easter Road ever since. Their subsequent silverware party was wrecked by a Hearts side who proved to be unwanted guests when Andrius Velicka’s goal ensured victory for the Jambos in the previous derby. Then came the very public player revolt against manager John Collins, before Hibs crashed out of the Tennent’s Scottish Cup to Dunfermline, the side who stood bottom of the Bank of Scotland Premier League. There may not have been a great deal for Hibs to play for in terms of points but pride was at stake for both clubs at Tynecastle. Hearts made two changes from the side who were held to a draw by Aberdeen last week. Marius Zaliukas was back from suspension and he was drafted into the first team, along with Pospisil. Tomas Kancelskis and Velicka had to settle for a place on the bench. Laryea Kingston remained in the starting XI after the club’s decision to appeal a three-match ban which would otherwise have kept him out for the remainder of the season. Collins made three changes for the final Edinburgh derby of the season. Shelton Martis, Damon Gray and Guillaume Beuzelin – back from suspension – all started the game, in place of Kevin McCann, Ross Chisholm and Abdessalam Benjelloun. There was no place in the 18-man squad for Scott Brown, although he was free from suspension. Hearts enjoyed the best possible start when they broke the deadlock with just 30 seconds on the clock. Pospisil caught Hibs unaware when he surged into the box, shrugging off Shelton Martis, before slotting into the bottom right corner of the net. Hibs tried to hit back immediately at the other end when Steven Fletcher set up Gray, but the youngster’s effort flashed across the face of goal and wide. 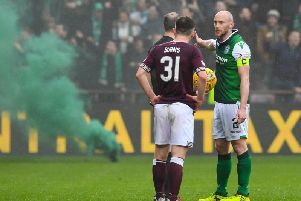 Hibs were clearly rattled and McNeil only just managed to fumble the ball from the feet of Roman Bednar before he could pull the trigger, before smothering a point-blank Pospisil shot as Hearts piled on the pressure. Bednar was proving to be a menace and was unfortunate to see his header palmed off the line by the Hibs goalkeeper, and Rob Jones hooked the ball to safety. McNeil then did well to deny the Hearts player again from 10 yards out with an impressive block. But Hibs have been plagued by goalkeeping blunders and McNeil contributed another classic to the bloopers file as Hearts doubled their lead with 23 minutes gone. A Bednar cross into the box caused all sorts of problems, with the goalkeeper flapping comically and Driver pounced on the loose ball to rifle home. The home side ended the first half by hitting the woodwork, Zaliukas’ header crashing off the crossbar. Both sides made changes at the interval. Hibs swapped Martis and Gray for Ivan Sproule and McCann, while Bednar was sacrificed for Velicka. Hearts still looked dangerous but Driver should have done better with a free-kick on the edge of the box shortly after the restart. The shot was weak and there were no mistakes from McNeil this time. Hibs made their final substitution when Beuzelin made way for Merouane Zemmama, and he could have hauled Hibs back into the game almost immediately, only for his free-kick to be blocked at the near post by Craig Gordon. Fletcher, Christos Karipidis and Kevin McCann had all been booked and Takis Fyssas narrowly avoided joining the crime count when he was substituted for Jose Goncalves. Fyssas is quitting Hearts at the end of the season and made the most of his exit from the pitch by whipping off his shirt and applauding the fans but referee Stuart Dougal failed to issue the yellow card he pulled from his pocket. Hibs enjoyed more possession in the final 10 minutes of the game as they desperately tried to haul themselves back into the reckoning. They had the chance to put their city rivals under pressure when Steven Whittaker was felled on the edge of the box. But Fletcher’s resultant free-kick was comfortably held by Gordon as Hearts claimed the points and the plaudits. Hearts: Gordon, Karipidis, Zaliukas, Berra,Fyssas (Goncalves 60), Mikoliunas, Kingston (Tall 69), Ivaskevicius, Driver, Pospisil, Bednar (Velicka 46). Subs Not Used: Banks, McCann, Wallace, Kancelskis. Hibs: McNeil, Martis (McCann 46), Hogg, Jones, Whittaker, Shiels, Beuzelin (Zemmama 58), Stevenson, Murphy, Gray (Sproule 46), Fletcher. Subs Not Used: Simon Brown, Chisholm, Campbell, McCaffrey.